Stone house with sea views, organic garden near Fiscardo. Villa Gaia was a traditional stone olive oil mill dating back to 1895. It has been carefully restored according to the traditional architecture of the island yet with an aristocratic interior with meticulous attention to detail & with all modern conveniences.The villa enjoys a unique location right in a typical Mediterranean forest.The rural setting provides tranquility & relaxation for all those who appreciate rustic charm & authenticity. A private road leads up to the villa.The original thick stone walls & the height of the ceiling (6m) create a very pleasant & cool environment.Large French windows open up to a large raised terrace & garden that boasts breathtaking views across the Ionian Sea.An ancient wall on one side outlines the original grounds and guarding the pool, a tall majestic olive tree rises above the pretty stone paved terrace and a hammock tucked away in one corner simply invites indolence. Gather your own fruit & vegetables from the organic garden.We welcome guests who want to be involved in the process!The villa is situated 500m from Maganos village & 4km from the picturesque port of Fiscardo. Long array of beaches can be reached within 5min. Breakfasts included in the price. The villa is newly restored. It has an open plan living room and kitchen, 2 spacious bedrooms and two bathrooms.The master bedroom is located on the ground floor with en-suite bathroom. The second bedroom is on the second floor. Magganos village is located 500 metres from the villa and has everything you may need such as local tavernas, grocery shops and mini markets. Fiscardo is only 4km away. The organic garden on your property has a large variety of summer fruit and vegetables. (tomatoes, lettuce, cucumber, fresh onions, peppers, watermelons, melons,apricots and many others). A private road leads up to the villa where there is spacious private parking space. Sit by the private pool and enjoy magnificent sunsets. The 2 bathrooms of the villa are very tastefully done with attention to every detail! The bedroom on the ground floor has en-suite. Breakfasts and provision of products from the organic garden are included in the price. We had 2 truly wonderful weeks at villa Gaia. The villa is so pretty and has been beautifully renovated. The outside is lovely with comfy sun loungers, a beautiful view and my 2 children spent many a happy hour playing in the pool. Our stay was made even more special by the kindness of Nic and Claire who treated us to so many delicious home made treats and vegetables from their garden. The villa is only a short drive from Fiscado and the surrounding beautiful bays. A perfect holiday - so good we are returning next year! 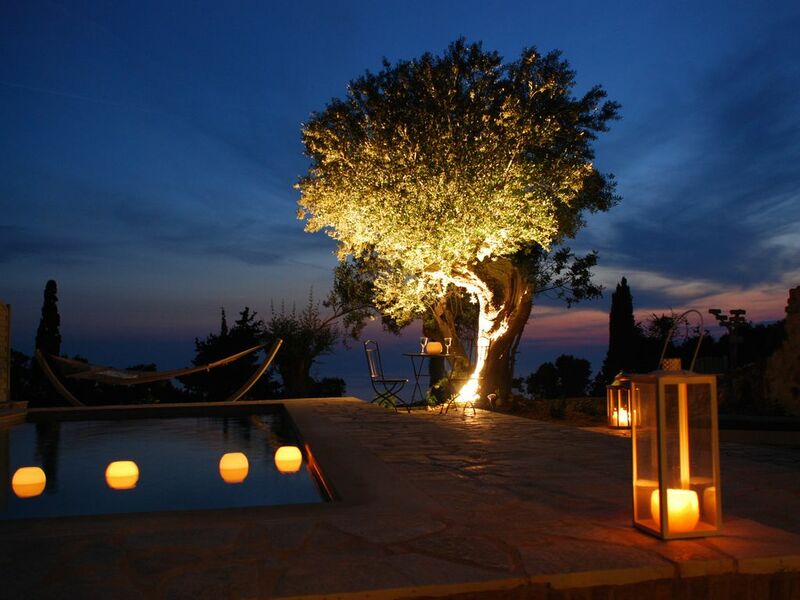 Villa Gaia is a very beautiful property in Kefalonia that provides privacy and serenity without being too remote. The villa is better than a 5 star luxury hotel for a number of reasons. It is very stylish, finished up to a very high standard, very clean, great location, with fantastic views and the owners are one of the kindest people I have ever met!!. My only regret is that we didn't stay longer. I would DEFINITELY recommend this villa and will hopefully come back again soon! I can only echo what other people have already said in their reviews. The villa is lovely and in a wonderful, tranquil setting. Georgia's parents were very friendly, hospitable and forthcoming with any help or assistance they could offer. We were made to feel most welcome and will definitely be returning in the not too distant future. Thank you very much for a most memorable stay. Even after circling the globe many times for our journalism and film careers, we return to Greece for its rare blend of scenery and spirit. At Steliata we found the ultimate expression of this land. Far beyond the elegant surroundings this erudite family has created in a ravishing location, they offer an experience for the soul: The magnificent breakfast feasts, which bring new meaning to the words ‘fresh,’ ‘local’ and ‘handmade,’ were as heartfelt as their enthusiasm for rare spots like Foki Beach and Maki’s Taverna: We will remember those luscious ribs for the rest of our lives, as we shall remember Steliata. We will return and send our most ‘special’ friends. I can't recommend this villa highly enough. Not only is it beautiful inside and out, from the basil outside the front door to the hammock in the garden where you can listen to the goat bells and look at gorgeous view - we were also looked after exceptionally well by Georgia and her wonderful parents who embodied Greek warmth and friendliness at its very best.We actually felt like we were staying next door to our extended family, such was the level of their hospitality. Perfect location, too, just a short drive from the fabulous eateries of Fiscardo and gorgeous beaches - the best of which our lovely hosts pointed us towards. We visited Kefalonia, never having been to Greece before. The island is idyllic, surrounded by a turquoise , crystal clear sea. We found wonderful little bays and breathtaking views as we drove around the island. We enjoyed many trips to Fiskardo which has a wide range of shops and excellent restaurants. We particularly enjoyed having coffee in the morning, watching the sailing boats anchoring in the harbour, and ferrying people onto the quayside. The Villa Gaia has been sympathetically renovated to a high standard and has everything we needed to make our stay extremely comfortable. Nick and Clare are excellent hosts and went out of their way to make sure our stay was successful. They were kind and generous and were able to give us an insight into real life in Greece. They made us Greek breakfasts and supplied us with fresh produce from Nick's organic garden. We really enjoyed meeting them. It was very helpful to have them giving us information about where to visit, where best to eat etc., and to tell you of any special events that were taking place. We spent three very happy weeks here and were sad to leave. After a few weeks at home we decided to return next year, for four weeks this time! Kefalonia is the island of 'contrasts' and one of the most picturesque and popular island of Greece. Kefalonia is known for its wonderful beaches with the turquoise waters and the impressive surroundings. At just 4 km from the villa the picturesque port of Fiscardo is located. Fiscardo according to the tradition, took it's name from the pirate Robert Guiscard who conquered the village in the 11th century. It is acclaimed as the only village on Kefalonia that escaped the ravages of the 1953 earthquake. It still maintains the traditional architecture of the Ionian islands and has been declared as a protected village. The port of Fiscardo connects with the port of Ithaca and Lefkada. Fiscardo is considered as a cosmopolitan tourist destination. A 30% deposit is required upon booking the villa while the remaining balance due 8 weeks before arrival.